While I’ve made a couple of efforts for Iris’ Dutch Literature events, I can’t say I’ve read a lot from the Netherlands. However, one writer I have tried a couple of times (with fair results) is Cees Nooteboom. I was very happy then to get home from work one day to discover a pile of books from MacLehose Press waiting for me, three of which were by Nooteboom. 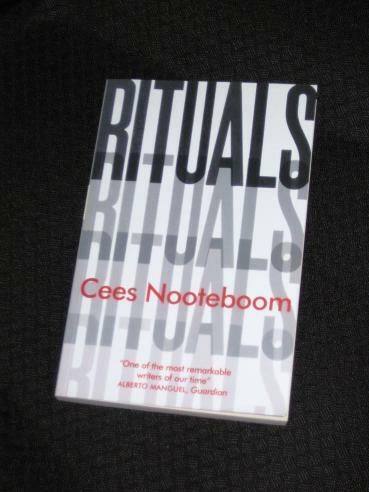 Rituals (translated by Adrienne Dixon) was Nooteboom’s first big success, and it’s definitely a book which shows an accomplished writer. The central figure is Inni Wintrop, a man about town who floats through life, sleeping around and making money through shares and art sales. When his wife leaves him in 1963, he decides (on a whim) to hang himself – that he fails in his half-hearted suicide attempt is, as the reader will discover, strangely unsurprising. However, Nooteboom is to spend the rest of the novel showing us that Inni isn’t the only one struggling to make sense of it all. Recently read “The Following Story” some time ago and really enjoyed it, and managed to find a free copy of “In the Dutch Mountains” from an exchange that prevents books going to landfill, so I'll read that next. Good to see his books getting re-issued. I really appreciated this post because I've become more and more interested in reading Dutch literature. I'm going to look these up to add to my other Dutch reads this year. Thank you for your wonderful blog.